Although doctors can often see early signs of Fuchs’ dystrophy in people in their 30s and 40s, the dystrophy rarely affects vision until people reach their 50s and 60s. Fuchs’ dystrophy is detected by examining the cornea with a slit lamp microscope that magnifies the endothelial cells thousands of times. The health of the endothelium is evaluated and monitored withpachymetry (which measures the thickness of the cornea) and specular microscopy (which photographs the cells for counting). 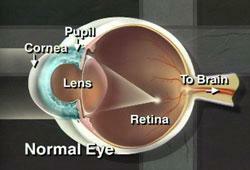 As the dystrophy becomes more advanced, corneal clouding may make counting the cells impossible. As people age, the lens within the eye often becomes cloudy, developing into a cataract.Cataract surgery is very common and has a very high success rate. Any eye surgery causes some damage to the delicate endothelial cell layer of the cornea, causing a reduction in the number of cells remaining to pump water from the cornea. If the number of endothelial cells is insufficient following cataract surgery, corneal swelling will develop, reducing vision. 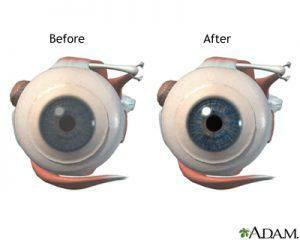 Corneal transplantation may be necessary to recover vision. When patients with Fuchs’ dystrophy develop cataract, it is important to carefully evaluate the status of the endothelium to decide whether the cornea is likely to continue to function well following cataract surgery. A recommendation may be made to combine cataract surgery with corneal transplantation. One combined surgery can achieve what would otherwise require two separate surgeries with a longer post-operative recovery.